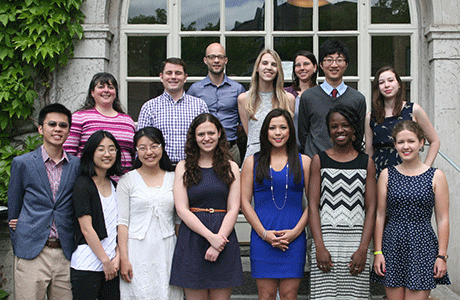 Eight undergraduate concentrators from Chemical and Physical Biology (CPB) and Neurobiology received Hoopes Prizes for their theses in May 2015. The Thomas Temple Hoopes Prize, a Harvard College-wide honor, was established in 1982 to “grant awards to undergraduates on the basis of outstanding scholarly work or research.” The Hoopes Prize particularly recognizes scholarly writing and presentation. Each of this year’s winners receives a cash award of $4,000. Their nominators receive $1,500. The 2015 John E. Dowling Thesis Prize was awarded to Bianca Nfonoyim for her thesis “Microglia Mediate Synapse Loss in Early Stage Alzheimer’s Disease Via the Classical Complement Cascade”. In this thesis, Bianca investigated the role of a subtype of glia cells known to be involved in innate immune defense and inflammation response in the brain. Using a variety of cellular and molecular approaches, Bianca studied how and when mircoglia are involved in synapse loss in mouse models of Alzheimer’s disease. Ultimately, she found microglia were actively engulfing synapses at very early (pre-plaque) disease stages. Bianca performed her thesis research in Beth Steven’s lab at Harvard Medical School. The 2015 Lawrence J. Henderson Prize was awarded to Alexandra Rojek for her thesis “A Regulatory Model of Heat Shock by Protein Assembly”, which was carried out in D. Allan Drummond’s laboratory at the University of Chicago. In her thesis, Alexandra describes exciting data that support a new model for the response of cellular proteins to heat shock; she shows that many proteins involved in the translation pathway and critical to the heat shock response do not simply coalesce into non-functional aggregates but self-assemble into massive functional complexes that may play an important function in regulating the translational response of the cell to heat shock stress.Three additional students—two Organismic and Evolutionary Biology (OEB) concentrators and one Computer Science (CS) concentrator—who are also in MCB labs received Hoopes Prizes.